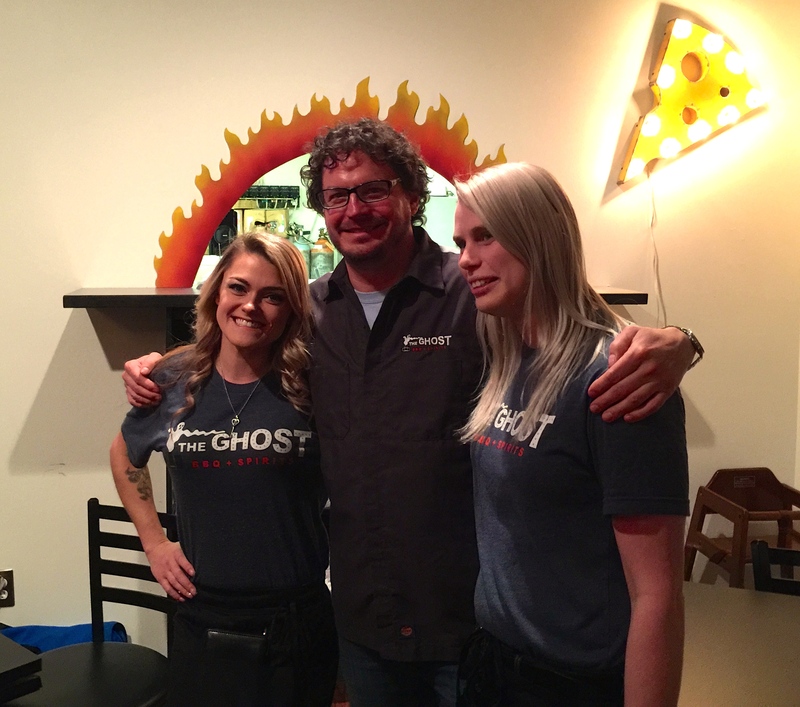 The Ghost BBQ & Spirits has taken over the space previously occupied by George’s, immediately adjacent and connected to the Boulder Theater. As we previously wrote about George’s over four years ago, it is not easy in this space to create a restaurant that becomes anything other than a Boulder Theater afterthought for both locals and visitors. We believe The Ghost has a real shot at being more than the theater’s sidekick. The Ghost has a number of factors in its favor. First and foremost, the establishment was founded and is run by Bob Sargent, who owns Savory Cuisines Catering and has a wealth of experience and contacts in town, including having prepared food for Avery’s customers, Crocs’ and Gaiam’s employees, and at Bacaro, among others. Perhaps more importantly, Sargent is very personable, hard working, and a little nuts – a good combination to make something like The Ghost succeed. As just one example, while visiting The Ghost recently (courtesy of the restaurant), Sargent told us about a promotion he plans to conduct within the next few weeks called Find the Ghost. It turns out the owner likes to drink Grand Marnier but, to keep himself from overindulging (“too easy as a chef“), drinks only from mini bottles. Sargent plans to take several thousand of these bottles, wrap promotional materials and coupons around them, and distribute them to downtown Boulder businesses, in addition to hiding some around town that contain free meal coupons. Another factor The Ghost has going for it is its waitstaff. We counted four young women, all of whom were personable, dedicated, and hard working. It didn’t matter whom you asked for help, that person would seem to drop everything and respond to your needs. The menu itself at the restaurant is appealing. The food carries lots of bar-be-que favorites, such as slow pulled pork and smoked chicken, accompanied by corn bread, baked beans, and cole slaw. Five sauces complement the food, including the aptly named Ghost Pepper Death Sauce. 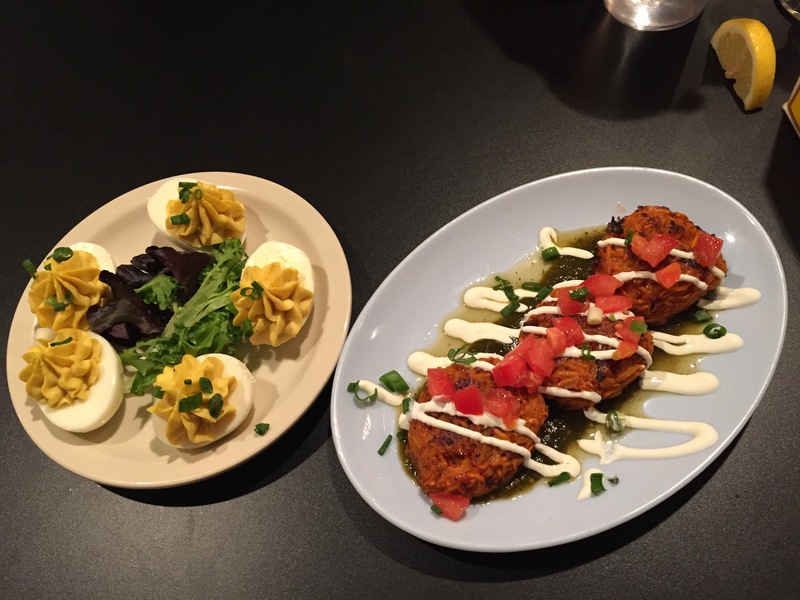 The menu also veers into the unique with shrimp & yam cakes, scallion deviled eggs, and a brisket reuben sandwich. Sargent faces some unique challenges with the location, which he is attacking creatively. By knocking a service window through the wall of the back room, what was a gloomy grotto in George’s is now a hip and flowing space. (The amazing wall art has something to do with that.) It also means servers no longer need to huff plates through the crowded bar! Since the kitchen lacks ventilation for a proper smoker or burner set, Sargent has worked out a scheme using Savory’s high volume equipment off-site and installing high moisture heaters (CVAP) and panini presses at the Ghost. The former is working brilliantly — all our meats were perfectly warm, “barky” and moist — while the kitchen’s still getting up to speed on the latter for the sandwich breads. We expect that’s just a growing pain. 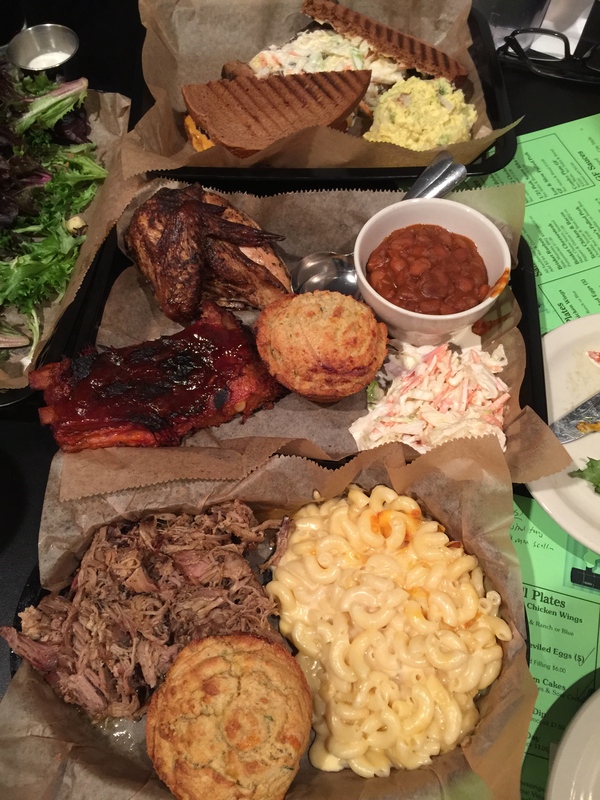 Overall, the food was very satisfying, with the strong points being the traditional BBQ plates and sides (mac and cheese, deviled eggs, cornbread). The less traditional offerings (shrimp and yam cakes, BBQ Reuben) did not quite hold together on taste and are less essential, with the exception of the Smoked Brisket & Muenster Salad, which was an excellent combination — unique to Boulder we suspect — of a delicious chunk of meat on a bed of healthy greens. Perhaps most impressive, on our visit during an off-theater night The Ghost had the feel of a real restaurant, with patrons coming off the street for the cuisine and atmosphere, not because of the location next to the Boulder Theater. We would recommend The Ghost for a visit at lunch or dinner. Just check the Boulder Theater schedule first. This article was written by Allan Wright and Paul Getty, EDB writers who were guests of the establishment.